Let’s Pretend We’re In India, And Not On Hoth, Which Is Where We Live Now. So I’ve been cracking Hoth jokes since this past weekend, when snowpocalypse was but a mere twinkle in the Northeast’s eye. This morning, I asked my boyfriend to bring the Tauntaun around so we could ride to the nearest park and go sledding. Hilario, I know. Oh, but I wasn’t always this jolly. I spent most of last night freaked out by the end-of-days posts on Gothamist and worried I didn’t stock enough milk for the pending storm (spoiler alert: I didn’t). In case you were wondering, I’m writing this post on Tuesday evening, just as the big “blizzard” is winding down. I spent today working from home, which is simultaneously happy and sad.Happy because I can see the alternate universe in which I attempted to commute, and it involves me crying on the Manhattan-bound F train platform and picking frozen tears off of my face. I need to make some life changes. How ELSE I survived the storm. It’s sad because I AM GOING COMPLETELY STIR CRAZY GUYS OMG. I recently made the mistake of learning that my phone has a built-in pedometer, and now I cannot stop tracking my steps, and since I live in an apartment in New York City, there are only so many steps I can take. Today, so far, I have only taken thirty steps, and knowing that is driving me bananas. As a result I am spending entirely too much of today walking from wall to couch to television to wall again whilst obsessively checking my phone to see the numbers shoot up. I am a sad, pajama-clad, live-action game of Pac-Man. Wait! Forty! I’m up to forty steps! Progress! And how ELSE am I riding out this non-blizzard? With payasam! “WTF SHIBOW?! Be a little more aggressive with the spell check,” is likely how many of my non-Malayali readers are reacting right now. But fear not, friends! I can still spell like a mother. Payasam, a South Indian treat, (similar to kheer, which is a common North Indian dessert that can be found at many an Indian restaurant) is a sweet, milky dessert containing noodles, raisins, nuts and a few spices. It’s almost a pudding, almost a sweet soup. Payasam was always THE best part of all family functions for me, mostly because I am a sugar fiend and a little bit because I have poor social skills. If you’re more of a cupcake and cookie kind of human, this dessert is weird for you. I get it. But you need to try this, a. because it’s easy, and b. because it will give you the opportunity to open the eyes and stomachs of all of the other cupcake-and-cookie loving humans around you to a new, glorious comfort food. Let’s do this. To begin, we’ll make our clarified butter, if you don’t already have some ghee handy (I didn’t). For two tablespoons of ghee, melt about four tablespoons of butter over medium-high heat in a medium-sized saucepan, then reduce heat to low when butter is melted. 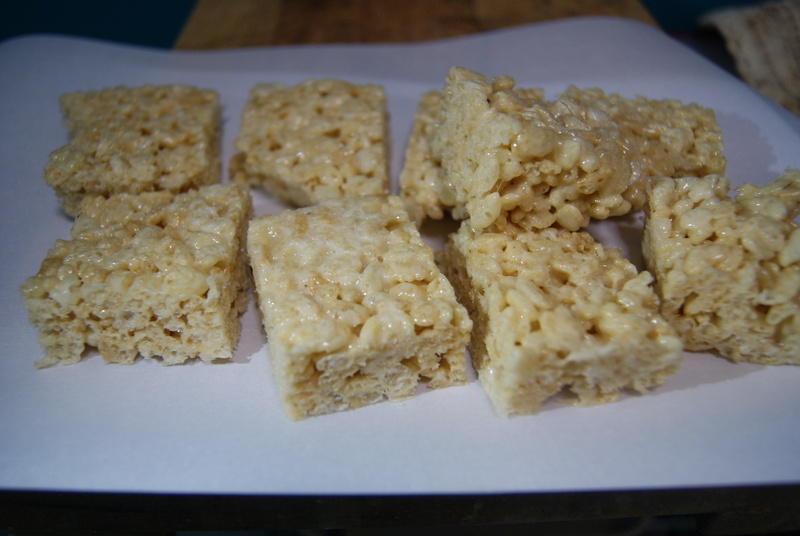 Allow to cook until the butter browns and a foam forms on top, about 6-7 minutes. 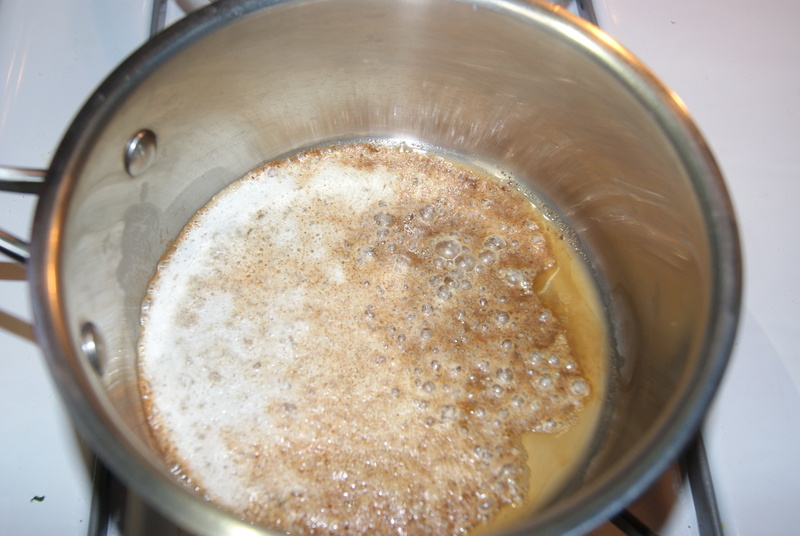 Skim the foam off, then pour butter through a strainer. Discard strained solids, and pour clarified butter back into the saucepan. 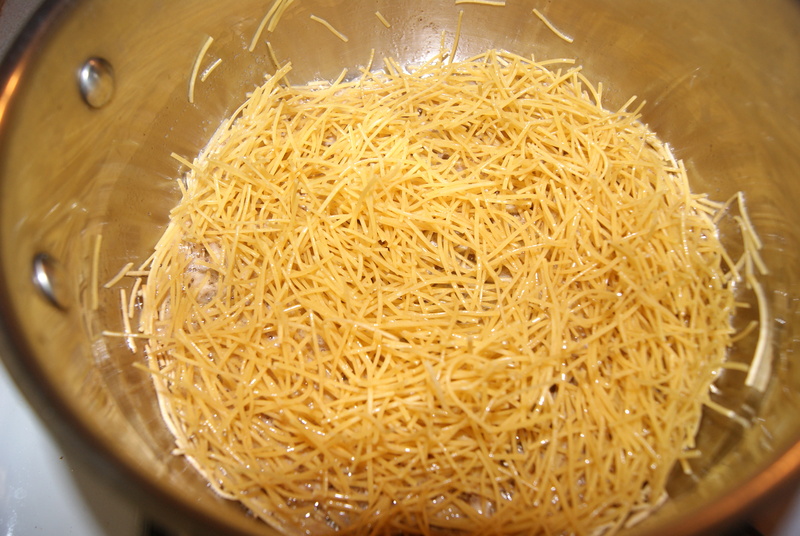 Over medium heat, saute noodles in ghee until lightly browned. 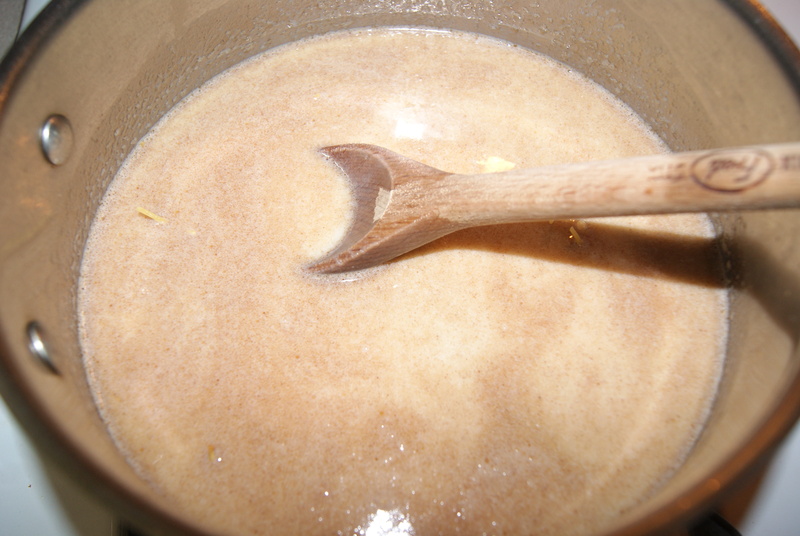 Pour in milk, sugar, and spices and bring mixture to a boil, stirring occasionally. Once mixture reaches a boil, add in raisins and cashews, and bring heat back down to a simmer. Allow it to cook until the milk thickens and the pasta has softened, then remove from heat. Serve hot, warm or cold. On days like this, it’s absolutely perfect warm. So, it may not look like much, but WOW. I know I’m a highly emotional, extremely sentimental person, so having a bowl of this definitely brought a couple of tears to my eyes. It’s legit. My dad happened to be dropping by just as I was done making the payasam (truth is, he was dropping off blizzard food for me and my boyfriend, because he is an Indian father and does not believe we eat anything but Multigrain Cheerios and also is a nice human being), so I set him up with a to-go bowl for the family. My mom (who’s celebrating a birthday today– HAPPY BIRTHDAY MAMA! <3), after giving me several pointers which were subsequently worked into the above recipe, praised it, which is really all I needed to hear. 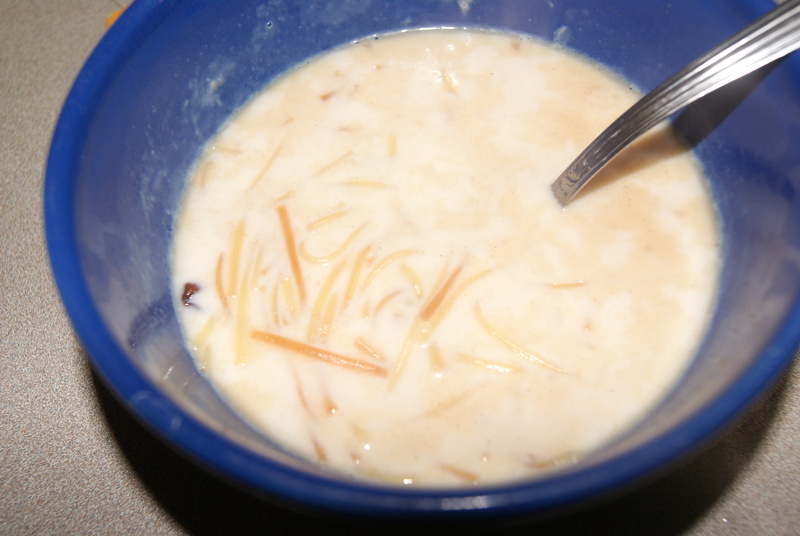 Payasam. Kid created, Indian mama approved.